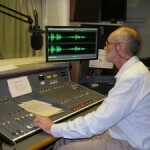 The following gives an insight into how the Oxtalk talking news service works, explaining each part of the process from compiling, editing and recording to copying the flash drives and sending them out to listeners. The rota system ensures that the week-by-week responsibility is spread around the volunteer team. Each team of three works under the guidance of an Editor who in turn is responsible to the Chief Editor. The compilers select items from the week’s newspapers. These are then passed on to the Editor who checks them for duplication, and perhaps adds other items until there are enough items to fill the hour’s recording. 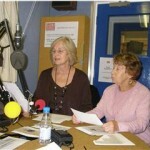 The Editor then takes the items up to the studios for the reading team to record. We have written permission to extract news from all the local newspapers. 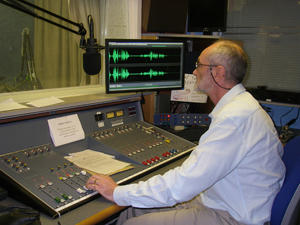 The reading of the news items takes place weekly on a Tuesday evening at the studios of Radio Cherwell. 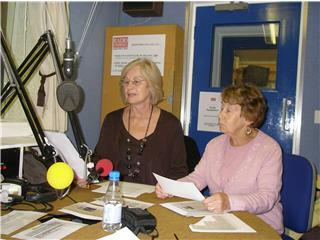 Teams of 3 readers record the news, under the supervision of a desk technician. The Readers’ Rota and prospective readers’ list is in the charge of a Committee member. There are usually 6 trained technicians, and sometimes one or two more in training, working on a rota system. Responsible for the production of the Master recording, the technician will position the microphones to obtain the best sound quality, adjust the recording levels and be responsible for the timing. S/he may on occasion also add pre-recorded items. There are 6 copying teams involved on a rota basis; at least one person in each of the 4-person teams must be able to operate the copying machines. One member of each copying team will collect the sacks of returned pouches from the post room and take them to the copying room at the Churchill Hospital where the master flash drive containing the week’s recording will have been left by the technician. The incoming pouches are emptied – and their address labels turned – then they are sorted and re-filled with a newly recorded flash drive and put into a post bag. When all is finished the post bags are taken to the post point. The time taken to produce the required number of flash drives, which may vary from week to week but is usually around 100, is about 1 hour providing there are no hitches.